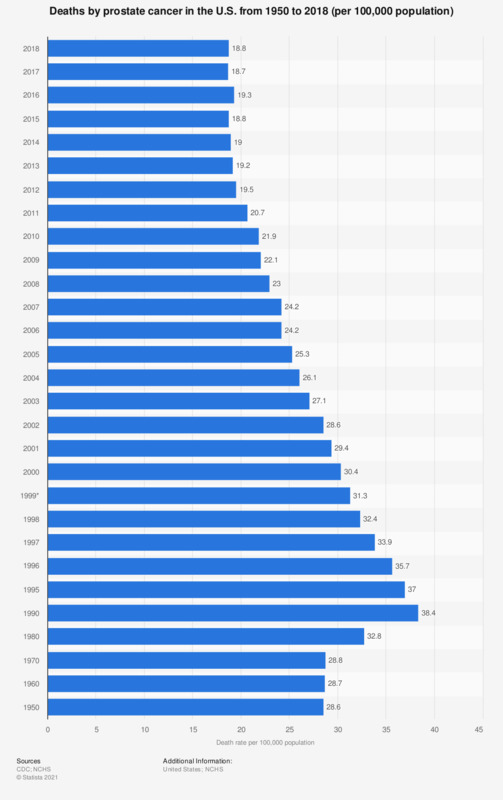 This statistic shows the prostate cancer death rate in the United States from 1950 to 2016. In 2016, there were 19.3 deaths by prostate cancer per 100,000 men in the United States. Data for years not listed in the pdf-version of "Health, United States, 2017" were taken from previous reports. All rates are age-adjusted. Age-adjusted rates are calculated using the year 2000 standard population. Prior to 2001, age-adjusted rates were calculated using standard million proportions based on rounded population numbers. Starting with 2001 data, unrounded population numbers are used to calculate age-adjusted rates.